T P M S M T D J a n u a r y 2 0 1 9 74 A U T O M O T I V E I N T E L L I G E N C E ( 855 ) 288-3587 autel.com / maxitpms.com Register and update tools for latest coverage © 2018 Autel Intelligent Technology Inc. TS508 98 % VEHICLE COVERAGE PROGRAMMABLE UNIVERSAL TPMS T P M S SUBJECT VEHICLES: Honda HR-V 2016-2018. RELEARN PROCEDURE? No. SPECIAL TOOLS NEEDED? No. 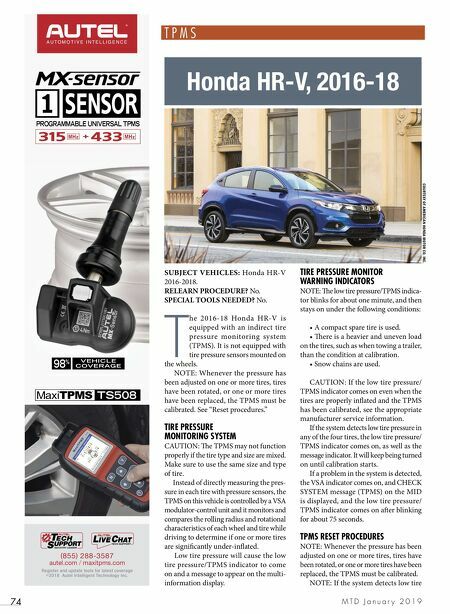 T he 2016-18 Honda HR-V is equipped with an indirect tire pressure monitoring system (TPMS). It is not equipped with tire pressure sensors mounted on the wheels. NOTE: Whenever the pressure has been adjusted on one or more tires, tires have been rotated, or one or more tires have been replaced, the TPMS must be calibrated. See "Reset procedures." TIRE PRESSURE MONITORING SYSTEM CAUTION: e TPMS may not function properly if the tire type and size are mixed. Make sure to use the same size and type of tire. Instead of directly measuring the pres- sure in each tire with pressure sensors, the TPMS on this vehicle is controlled by a VSA modulator-control unit and it monitors and compares the rolling radius and rotational characteristics of each wheel and tire while driving to determine if one or more tires are significantly under-inflated. Low tire pressure will cause the low tire pressure/TPMS indicator to come on and a message to appear on the multi- information display. TIRE PRESSURE MONITOR WARNING INDICATORS NOTE: e low tire pressure/TPMS indica- tor blinks for about one minute, and then stays on under the following conditions: • A compact spare tire is used. • ere is a heavier and uneven load on the tires, such as when towing a trailer, than the condition at calibration. • Snow chains are used. 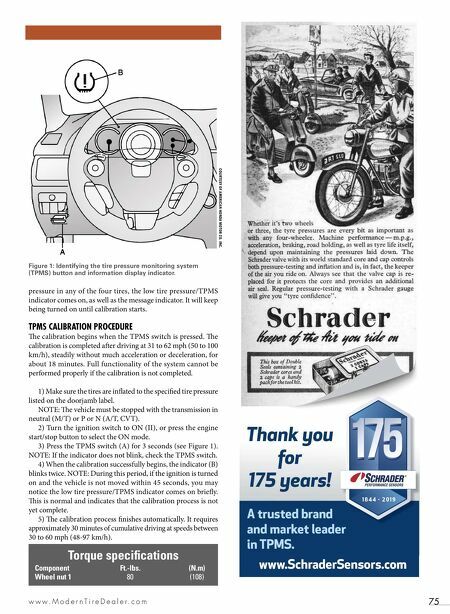 CAUTION: If the low tire pressure/ TPMS indicator comes on even when the tires are properly inflated and the TPMS has been calibrated, see the appropriate manufacturer service information. If the system detects low tire pressure in any of the four tires, the low tire pressure/ TPMS indicator comes on, as well as the message indicator. It will keep being turned on until calibration starts. If a problem in the system is detected, the VSA indicator comes on, and CHECK SYSTEM message (TPMS) on the MID is displayed, and the low tire pressure/ TPMS indicator comes on aer blinking for about 75 seconds. TPMS RESET PROCEDURES NOTE: Whenever the pressure has been adjusted on one or more tires, tires have been rotated, or one or more tires have been replaced, the TPMS must be calibrated. NOTE: If the system detects low tire Honda HR-V, 2016-18 COURTESY OF AMERICAN HONDA MOTOR CO. INC.